What is 15 - 2 ? This book is especially recommended for teachers of law and economics. Even for its clarity should be consulted by politicians and statesmen. Absolutely timely, this book examines old problems through a fresh lens and offers policy solutions that would make a more equitable world possible. On a subject that really matters for a future world, this book is excellent. Land is a key resource of nature. Land value should be shared by all rather than individually owned. Politics and business please take note. Quick, informative read while putting the concept of rent into concrete form. I'll never be looking at McDonalds, Walgreens, and Walmart stores ever the same again. Compelling arguments for the land value tax and other ways to combat the high amount of rent seeking impeding our economy today as inequality grows while the planet deteriorates, and everyone's natural right to pursue life, liberty, and happiness is ever more so impeded and constrained by those who want something for nothing. Disappointed that Veblen was so easily brushed aside as he clearly wrote about the framework of powers and human tendencies to be battling against and negotiated through, that leaves the common man at their mercy. Any well articulated economic case that presents an argument for shared ownership and responsibility for natural resources is worthy of attention. Not only is this case compelling, it is also well written. Fred Harrison illuminates again how 'rent' is constantly left out of the appraisal of most economists and politicians on how to keep the wheels of a modern economy moving. A 'must read'! How to solve the proplem of inequality. The benefit of knowing economics is the understanding of the implicit reality beneath superficial appearances. Rent Unmasked uncovers the impilicit reality of land rent and its profound effect on economies. We cannot understand today's economic problems and their remedies unless we unmask rent. A great tribute to Mason Gaffney from a collection of fine economists from around the world. Forget Thomas Piketty - if you want to know how to cure the economic ills that produce vast inequalities, this is the book to buy. A thorough assessment of today's economic system, written for the layman. A book that evaporates the illusions, foisted on us from birth by rent-seekers. We collectively produce plenty of wealth to fund the services we all need. Here is revealed how to find, claim and collect it. To cancel inequality! Little known idea that is philosophically sound and works!! Shortly after publication of this book, I obtained a copy and prepared a lengthly review. Fred Harrison and the other contributing authors do us a great service by building on the groundbreaking economic analysis provided by Professor Mason Gaffney over the course of a long and distinguished career. If only the wisdom contained in these essays and in Mason Gaffney's own writings will find their way into the public dialogue over economic policy the future would be much brighter than it is likely to be. he book discusses the cause of inequality, the unbelievably high cost of home ownership or apartment rentals - taking between a third an a half of poor people's income, and the reason why national debts often exceed the GNP's of many nations with no solution in sight as debts climb higher. It also offers solutions, something apparently beyond the capabilities of most contemporary politicians. Mason Gaffney deserves a Nobel prize! This is indeed the solution to global economic inequality and environmental destruction. 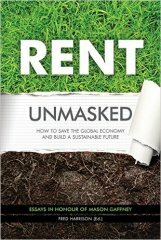 "Rent Unmasked", edited by Fred Harrison, is a tribute to Mason Gaffney, arguably the world's greatest natural resource economist. Whilst 'economic rent' may not be a phrase on everybody's lips, once it is understood to relate mainly to the unearned incomes from the natural resources around us, contributions by the book's formidable authors calling for its capture to the public purse, as an alternative to levying arbitrary taxes on the productive economy, become unassailable in their logic. As world economies descend into a hopeless quagmire, the most obvious measure of the failure of modern economics is the extent to which we now allow publicly-generated land rent to be privately capitalised into ever higher land prices (and bubbles) at a clear cost to wages, earned profits and social health.